This panel took place at the Canadian Festival of Spoken Word on Kanien’kehá:ka (Mohawk) territory at the MAI in Montreal, Quebec, on Nov. 9th 2013. 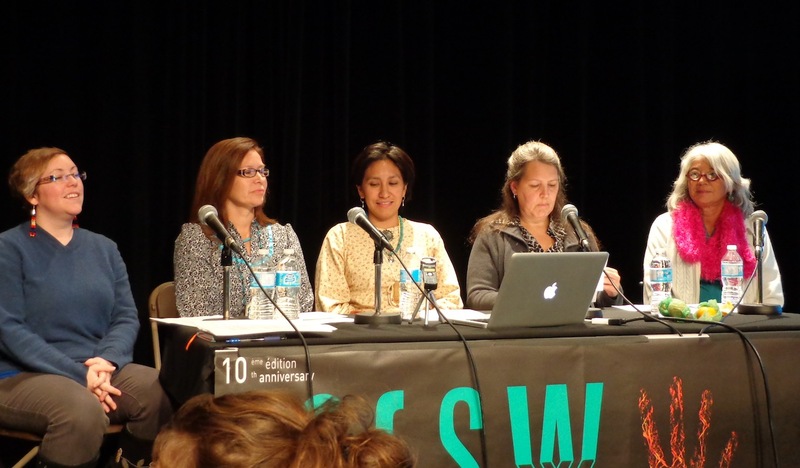 It featured distinguished indigenous language activists, poets and scholars. They drew from First Nations oral traditions, spoken word and linguistics to discuss and celebrate indigenous languages in Canada. 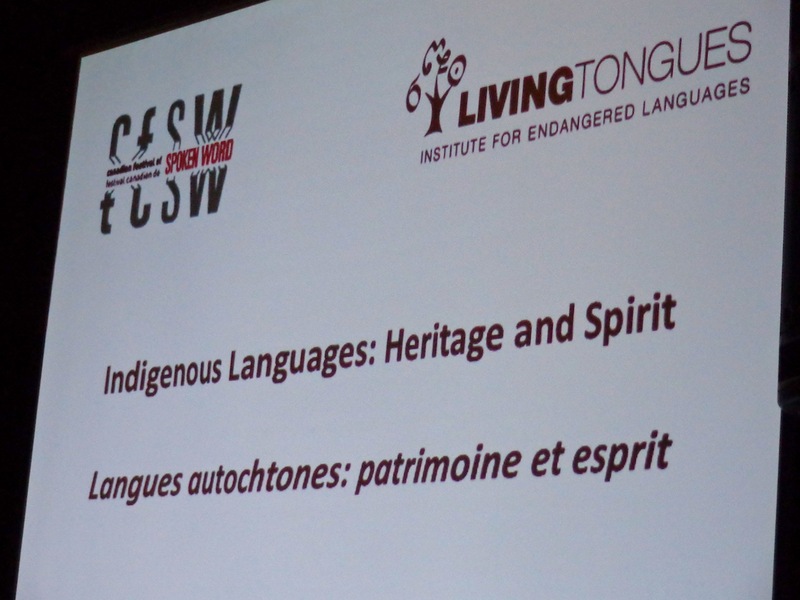 Panelists explored current threats that their languages face, and presented examples of community education initiatives that are underway to stop language extinction by engaging new generations of speakers. Among many topics, oral transmission, writing systems, phonetics, digital art forms and new media were discussed. We wish to extend a big thank you to everyone involved in this event! Thank you to the MAI, to the Festival, and to the Festival Director Moe Clark, to everyone who attended, and to everyone who gave presentations. We would like to emphasize how amazing it was to hear all of the panelists’ stories. It is so important to hear about their experiences and approaches to language conservation and revitalization directly from the language warriors themselves. Miigwech. 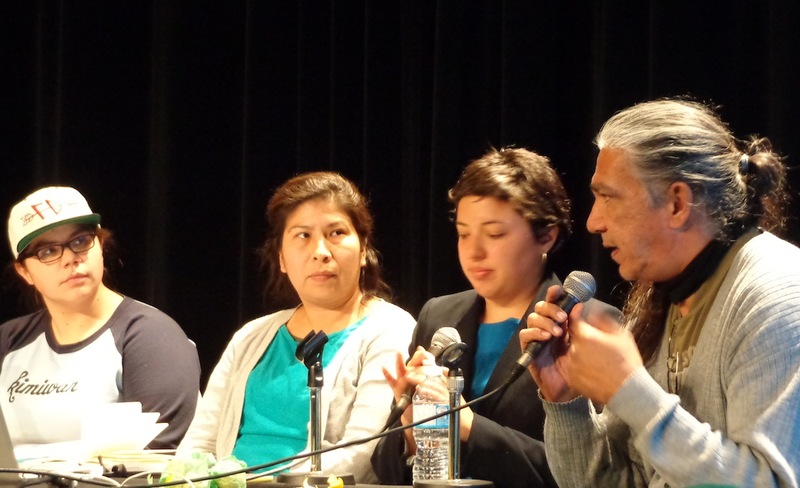 From left to right: Melody McKiver (Anishnaabe), Vera Wabegijig (Anishnaabe), Anna Luisa Daigneault (Living Tongues Institute for Endangered Languages), Jacques Newashish (Atikamekw). Photo by Leonor Daigneault. Indigenous Languages: Heritage and Spirits / Langues autochtones: patrimoine et esprit. Photo by Leonor Daigneault. From left to right: Chelsea Vowel (Plains Cree), Kahtehrón:ni Iris Stacey (Mohawk), Leith Mahkewa (Oneida / Hopi / Mohawk), Manon Tremblay (Muskeg Lake Cree), Louise Halfe Sky Dancer (Cree). Photo by Leonor Daigneault. This entry was posted in Endangered Language Activism and tagged Anishnaabe, Anishnaabemowin, Anna Luisa Daigneault, canada, canadian festival of spoken word, Chelsea Vowel, cree, endangered languages, indigenous languages, Jacques Newashish, Kahtehrón:ni Iris Stacey, Kanien’kehá:ka, Leith Mahkewa, living tongues, Louise Halfe Sky Dancer, Manon Tremblay, Melody McKiver, moe clark, mohawk, Montreal, Muskeg Lake Cree, plains cree, Quebec, Vera Wabegijig by livingtongues. Bookmark the permalink.